Graphics and Logo To understand it better; let’s start with a basic question- why is custom notepad necessary for your business? It becomes one necessary option to promote a service or product and that too for a long time. The next celebrated use is for the recipient, who can utilize it for scribbling some information. As per a good rule of thumb on a promotional notepad, a logo, text, or graphics should occupy only 10% to 20% and the 80% space for note taking.As said before, logo is the most important brand-building symbol, so it ought to be such that it stands out and strikes whenever someone turns pages for scribbling some information or whenever they open notebook for writing. It is always better to put logo at the top of the notepad because you are indulging in sub-conscientious promotional advertising. You can add element of action at the bottom of the notepad by adding your contact details and preferably a business byline. For example – If you are running a pizzeria in Durham, North Carolina, along with contact information, you can add “Best Pizzas in Durham” or if you are trying to build your personal repute then add during campaigning then try to persuade by adding text such as “Vote for Sebastian Jones – After All Experience Counts”. Size What is the best size for my notepad? Custom notepads are offered in several sizes. Some of the most popular sizes are 5.5” x 8.5”, 4.25” x 5.5”, 8.5” x 11”, 2×3 , 5×3 and 3.66” x 8.5”. The promotional notepads with smaller widths are sought for value gifting during tradeshows and other mass marketing events because they are affordable such as 2 x 3 , 4.25” x 5.5”, 3.66” x 8.5”, 3×3, etc. 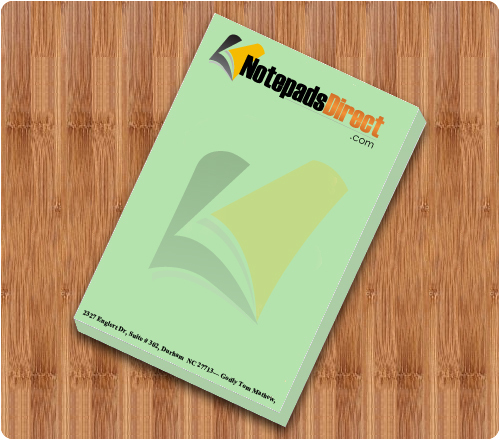 The larger notepads are availed by companies for fostering internal awareness generation. They are typically employed in offices during boardroom meetings, conferences, events, etc. Sheets This will totally depend on your target audience and their requirements. Usually you will find notepads with 10, 25, and 50 or more sheet configurations. The smaller sheet configurations are expensive because the manufacturing costs are big, but they are perfect for gifting during tradeshows or other mass promotional events. Larger sheet configurations such as 50 sheet notepads are perfect for intra-value creation within office. Paper Color Although white is the most preferable color for any branding stationary, but you can also opt for pastel shades or neon shades depending on your target audience. You have to check how your brand information will look against these colored pages prior to confirmation. You should always prefer the sheets, which can be best reflect your brand information and make it stand out. Choice of Color for Printing Many traditionalists may argue that by far black is the only color for adding impact on their brand information. However, this is not true because full color printing is the most preferred choice for building brand credibility.Gone are the days, when people used to think that only black means authority because today the world and people in it both are getting colorful. After perfecting your custom notepads, you can make a choice of buying them from any reputed online store selling them because you can expect to enjoy benefits of free shipping, free art setup and free online design proof – if not much more.